Heathrow’s operator BAA is taking the flack for the airport’s dreadfully long line, but its entirely the responsibility of utter incompetence in the British Home Office. 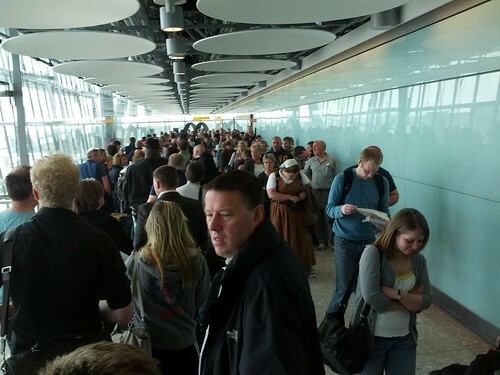 Immigration line at Heathrow Terminal 5 in London. Photo by Cory Doctorow. Passengers arriving at Heathrow airport are facing “horrendous” delays at immigration, prompting fears that the system will be overwhelmed once the London Olympics get under way. Angry passengers reported queuing for nearly two-and-a half-hours last week – with some queues starting far outside the immigration hall – only to find empty passport control desks and uninterested staff. Labour has warned the Government that it has to get a grip on the “immediate crisis brewing less than four weeks before the Olympics”. BAA, which runs Heathrow, admitted that target times for passengers passing through immigration were missed, while union officials warned of a doomsday scenario caused by a combination of fewer fully trained staff, an influx of holiday passengers, and Olympic crowds. An extra 650,000 passengers are expected to pass though the airport during the Games. BAA said that visitor numbers were starting to increase in line with the holiday season, and Olympic athletes and delegations were also arriving. On Friday, passengers at Terminal 4 were stuck in half-mile queues starting long before they even got to the immigration hall. They said that once they got there, two out of three desks were not manned and immigration officers “talked among themselves” while ignoring passenger demands to know what was causing the delays. Officials were also seen trying to stop passengers taking photographs of the chaos as an estimated 4,000 people waited in line. One businessman, who was waiting in the non-EU line, told The Telegraph that he waited more than two-and-a-quarter hours on Friday when returning to Britain from Italy. BAA target times are 45 minutes for non-EU passengers and 25 minutes for those with UK and EU passports. The company said that over a two-hour period on Friday morning, queue times were on average one hour and 30 minutes. There were similar problems later that day and also during busier periods on Saturday. With the eyes of the world on London, senior politicians are dreading a repeat of the scenes in April that led to the situation being called a national embarrassment in a report by MPs. In the wake of that scandal, Damian Green, the immigration minister, announced that extra border staff would be seconded to Heathrow, in many cases forming “hit squads” to be deployed at short notice to anywhere in the airport that is struggling to cope.